The majority of sealcoatings are water-based coatings, either based on refined tar (RTS) or asphalt Emulsion (AE). Such coatings are safe to handle, store, and provide years of projection to asphalt surfaces, when applied properly and allowed to cure under the right ambient conditions. In this article we will discuss the film formation mechanism and the desired ambient conditions for initial and final cure of sealcoatings. Water is the major component of sealcoatings, e.g. the sealer supplied as a concentrate contains typically 60% water by volume. After adding 30% water to 100 gallons of the concentrated sealer, the water proportion increases to nearly 70%, by volume. Sealcoatings, like other water-based coatings, cure releasing water to the atmosphere and reach their full strength after the release of all the water. It will be beneficial to understand how the water is released from the sealer film and the influence of the pavement and ambient conditions on the release of water and ultimate cure of the sealcoating films. • Mixed accurately per the mix design as agreed for the project i.e. proper dilution with water, sand loading, additive content, etc. • Allowed to cure “thoroughly” or “sufficiently” under a set of pavement and ambient weather conditions that will allow the coating to attain its optimal firmness. These “ideal” conditions are simply the ambient and pavement conditions that are specified by the manufacturers and accepted by the industry under which the sealcoatings shall be applied and allowed to cure. • Binder. The refined tar (RT-12) or asphalt cement (AC) is called the binder in sealcoatings. As you may know, both asphalt and refined tar are thermoplastic materials, meaning that they soften and melt at higher temperatures (about 100°F to 180°F) and become hard and brittle to cooler temperatures (below 60°). The binder is the backbone of sealcoatings. It is the ingredient that protects the asphalt pavement. In the wet state (uncured), sealer contains a fine dispersion of binder particles in the range of 2 to 5 microns (human hair is approx. 25 microns or 1 mil), in either spherical or elongated cigar shapes. Upon full cure the binder forms the continuous film, tightly holding all the fillers and sand/aggregate. • Clay, fillers and aggregates. To impart proper toughness to the sealcoating film and counteract the tackiness of the binder at elevated surface temperatures. • Specialty chemicals. Such as surfactants and emulsifiers to stabilize the sealcoating systems. • Water. As the medium. In most sealcoatings, water constitutes the major component, more than 60% by volume. Descriptions such as the full cure, final set or optimum strength convey the message that sealcoating has reached its full strength and is capable of performing its task, as a protective coating. Properly cured sealcoating forms a continuous film, free of voids or imperfections, which stop water, chemicals, salts, etc. from penetrating and damaging the asphalt pavement underneath. Understandably, any deficiency in the curing process will not allow the binder to fuse properly and leave voids in the film, thus resulting in inferior performance or failure. During the curing process, sealcoating films transition through various stages of water evaporation from the applied film. First it attains initial drying when the film becomes “tack free” to the light touch, then it becomes firmer (about 95% cured) to take light pedestrian traffic, and finally full firmness to withstand light vehicular traffic, when all the water is lost through evaporation. The conditions described below play the decisive role in determining the thoroughness of the overall cure process, therefore, sealcoating performance. These conditions are the recommendations of the industry and its research association, Pavement Coatings Technology Council (PCTC). These factors are important in obtaining the optimum cure of sealcoatings. Sealer should not be applied unless the pavement temperature is at least 50°F and the air temperature is 50°F and rising. As described in the foregoing sections, the fusion of the binder particles (in sealcoatings) to form a uniform and continuous film depends on their ability to soften under the ambient and pavement temperatures. The process of fusion is greatly enhanced at higher temperatures; say 75°F to 85°F. Conversely it is significantly reduced at temperatures below 50°F. Let us review the extremes; cold and hot temperature applications. 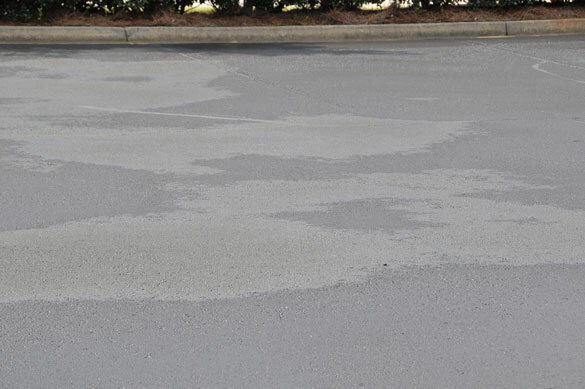 When sealcoating is applied below 50°F, refined tar (or asphalt) particles do not soften and form a continuous film, thus leaving clay and filler particles uncoated. The color of the sealcoating cured under such conditions usually turns out grey and blotchy in appearance and never returns to its characteristic dark slate black appearance even at higher pavement temperatures, at a later date. Simply the temperature of the pavement normally does not reach high enough to re-melt the binder particles and force them to flow and form a continuous film. Even if the pavement temperatures reached high enough, still it will not be sufficient to re-mobilize the binder particles to flow and envelope the clay and filler particles and form a continuous film. Needless to say sealcoating cured under cold weather conditions lack the integrity and are liable to fail prematurely. Sealcoating applications under hot temperatures can be equally problematic. Sealcoatings should not be applied under the summer sun (90°F ambient) without first cooling the surface with a fine mist of water, also called “fogging”. Water should only dampen the pavement, without leaving puddles. If applied to a hot pavement without “fogging” it, the sealcoating film almost gets “baked” as soon as it hits the pavement. The sudden loss of fluidity of the film, due to flashing of water, immobilizes binder particles and prevents them from fusing and forming a continuous film. Devoid of the proper fusion process, binder particles do not effectively envelop the clay and filler particles in the sealer film. Additionally, binder particles under such conditions do not reach the hardness imparted by the clay and fillers and continue to stay sticky and soft. And that could lead to lead to a problem called “tracking”, where the sealer is tracked on the floors or carpets, etc. Relative Humidity (R.H.) of the atmosphere plays a significant role in the cure mechanism. It directly influences the rate of water loss from the sealcoating film. Conversely, 90% means that the ambient air is loaded with moisture and has very little (10%) capacity left to hold additional water. Sealcoating applied under highly humid conditions will take a long time to cure because there is very little room for the ambient air to absorb the released water from the film. The sealer film will release only the amount of water that can be accommodated by the atmosphere. The atmosphere and the surrounding environment can be thought of as a sheet of paper towel: when dry it will soak up the spill but will not mop up if the towel is too wet. The drying and cure times specifications do not take wind velocity or air movement under consideration, however, it is a known fact that air movement, especially under highly humid conditions, helps sealer dry faster than without any air movement. A light breeze assists in the dissipation of the water and volatiles from the immediate vicinity. Conversely, under low humidity conditions (below 20-25%). the air movement may cause the sealcoat to dry a bit too fast. Sealcoatings being water based, cure by releasing all the water from their applied films. For their optimum performance, the cure conditions must be right. The cure of sealcoatings is decisively influenced by ambient and surface temperature, relative humidity and wind velocity. Sealcoatings cured under improper conditions are liable to have inferior performance characteristics.